Ever since I tasted kale chips at Whole Foods, I have wanted to make them at home and also start using kale as often as I use spinach, methi, beet greens or chard. Last time when I went grocery shopping I was daring enough to pick up both green and purple curly kale greens. First I used a small portion of it to prepare the “no-fail” dal recipe which most of the South Indians prepare at home using one of many greens available in India. 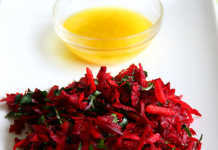 I prepared this beet greens dal recipe using kale. I was very excited that it turned out great. Then tried it raw in my blueberry green smoothie recipe instead of spinach and made this berry kale smoothie using purple kale. That was awesome too! So kale is indeed versatile like baby spinach. I started looking for kale recipes and that’s when I found this salad recipe. This kale salad is one of the simplest recipes one can ever make. I used a mix of green and purple kale leaves but either one should be fine too. 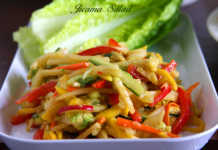 The original recipe uses lemon juice and chilli powder for the dressing. But I prefer lime juice and red chilli combination. I have used crushed red chilli flakes and garlic too. 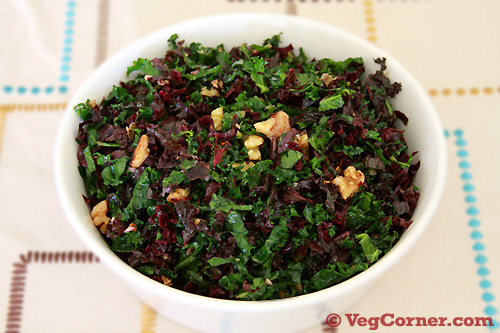 Get your daily dose of greens with this tasty and simple to put together kale salad. 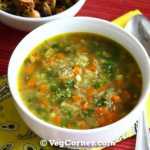 Load it up with other ingredients like cucumber, carrot, apples and cooked legumes of your choice to make it a full fledged meal. In a large bowl whisk together all the ingredients except kale. Toss in the chopped kale. Combine well and serve. Reserve the stems for making vegetable broth. Be sure to chop the leaves finely. 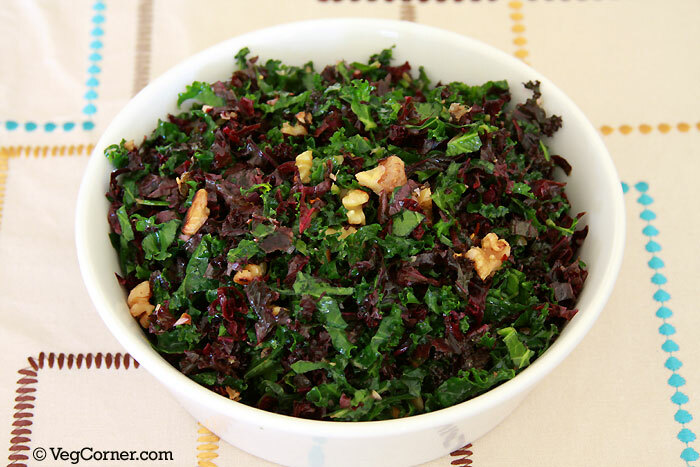 Unlike other usual salads, this kale salad cannot be consumed as a main dish because it involves a lot of chewing. So this salad is good in small portions. 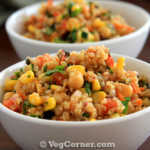 Or toss it with some cubed Tofu/Paneer, chickpeas, cucumber, tomatoes and other ingredients of your choice and use it as a filling for your wrap or pita to make it a meal. Like some of the suggestions in the original recipe, you could try this recipe by wilting the kale lightly on a stove top or in a microwave oven if you don’t prefer it raw. 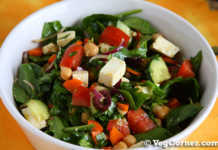 I am a healthy (eggless, meatless, dairy-less, fish-less, oil-less (mostly)) vegan, well you get the picture. I bought a lot of dates recently so I was looking for a date cake and happened upon your site. I will try the date cake soon without the oil and let you know. Looking at the ingredients it has to be good. 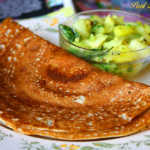 I love Indian food and try many recipes and occasionally go out to eat at the local Indian restaurant. It is a very good restaurant but use a lot of oil but it is a treat to go there, even though I know naan bread (I hope that is the name) is so good. I have a recipe for eggless naan but haven’t tried it. I just want to say thank you for your recipes and blog. You’re very welcome, Lynda. That’s very nice of you to stop by and leave a comment. Happy healthy baking! 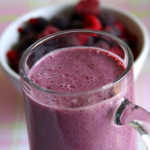 Interesting to know it works with dal and smoothie. I should try some time. This salad looks very good. Healthy and super interesting salad.